Madagascar’s history contains some truly enormous animals, from giant lemurs to giant tortoises. 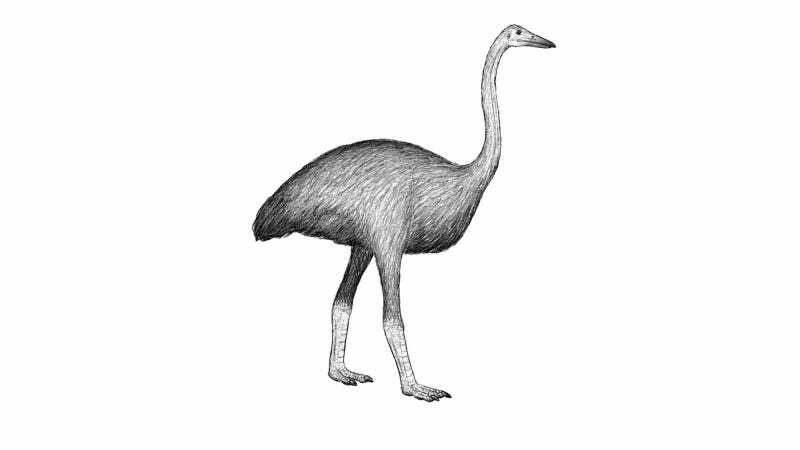 The island was also home to 10-foot-tall flightless birds, which sadly disappeared hundreds of years ago. But how we humans classified those birds was, well, a mess. There seemed to be 15 species of elephant birds before this most recent study, but there wasn’t much consideration of how bone sizes might vary between species, nor were there standardized comparisons based on sizes. It’s as if every time some 19th-century explorer came back from Madagascar, he decided he’d found a new species without doing (or having the ability to do) the background science, or basing their analysis on shape instead of size. This has long led to confusion about the taxonomy of these birds. Scientists hoping to figure things out performed a new analysis and ended up with just four species—including a new name for the very largest of the elephant birds. “This study constitutes the first detailed revision of elephant bird taxonomy for over half a century,” the authors from the Zoological Society of London write in the study published in Royal Society Open Science. This allowed the scientists to classify these huge, extinct birds in a more objective (i.e., less ego-driven) way. The researchers collected a data set of 346 elephant bird leg bones from museums across the world. These included 97 femora (thigh bones), 162 tibiotarsi (middle leg bones), and 87 tarsometatarsi (lower leg bones); bird legs differ from human legs thanks to evolution, which essentially fused some of what we’d call heel bones with the shinbone into an avian middle leg, and fused what we’d call foot bones with other heel bones into a third leg segment. Only 82 of the specimens were undamaged—the researchers took the intactness of the bones into account in their analysis. Then, the team performed a cluster analysis, meaning they ran a program that attempted to find clusters in the specimens’ measurements that might each represent different species or genera. The thigh bones clustered into three distinct groups, with one group appearing to have two subgroups. The middle leg bones clustered into three distinct groups without the subgrouping. The lower leg bones clustered into four groups. The researchers considered this three genera, one of which they broke into two species. The analysis rewrites our understanding of elephant birds. Though fifteen species were identified before, only four remained afterward. Cluster one became Mullerornis modestus. Cluster two became Aepyornis hildebrandti and Aepyornis maximus, both using previously available names. In short, a modern analysis of elephant bird bone specimens implied that the old, qualitative interpretation of elephant bird bones sort of sucked. The new, fancy science and math-based interpretation cleaned up the previous mess and gave a new identity to the largest bird to have ever lived, which, at 650 kilograms (1,433 pounds), was about the weight of a horse. We can only guess at what the elephant birds actually looked like. But at least now their species names are based on a more scientific methodology.